If you own and operate a mobile home park you need an insurance policy that is broad and comprehensive in nature. Whether your mobile home park is designed for manufactured homes or trailers your park has space for rent and also may have common areas such as pools, laundry facilities and playgrounds. 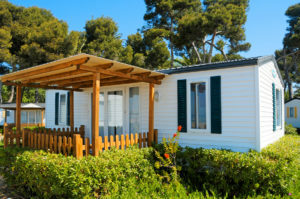 You’ll want a commercial insurance policy to protect your investment in your mobile home park. Mobile Home Park Owners have similar needs to landlords. Because you’re in the business of renting out a plot of land for people to park their trailers, manufactured homes or mobile homes on, you need to be sure you’re protected along with covering common areas such as utility services, playgrounds, roads and access points. You are not responsible to insure the trailers and mobile homes on your property or the contents in them. However, you will want insurance for your central building, underground utilities, roads & walkways, fences, common area appliances (laundry rooms) and any permanent structures on your property. Because your business is unique, there are not a lot of insurance companies willing to take the risk of insuring businesses like mobile home parks. By working with our independent insurance agency, we’ve partnered with some of the leading insurers of mobile home parks meaning you have options. Talk to an agent in our office to discuss your mobile home park insurance in Washington. Our agents understand your business and can help you find the right insurance coverage for your business. Get a quote today.